1.) notepad/pen/journal- because good ideas come at the most random moments. 2.) a good book- for those oh so lovely layovers. 3.) spare change of clothes- that 3 hour flight delay could turn into 12, or better yet, you miss the connecting flight due to some fog and have to wait until the next day for the next outgoing plane. 4.) tissues- sometimes the restrooms aren't always stocked with toilet paper, so better to be prepared. 5.) camera- is a must. My phone already has enough memory used up from taking pictures of random doodles and cute stationery products, so it's easier to keep vacation pictures and video footage separate by using a camera. Also, it's better to carry it on the plane rather than packing it within the suitcase, minimizing the risk of getting it squished and broken. See more of the carry-on essentials mentioned in my video here. 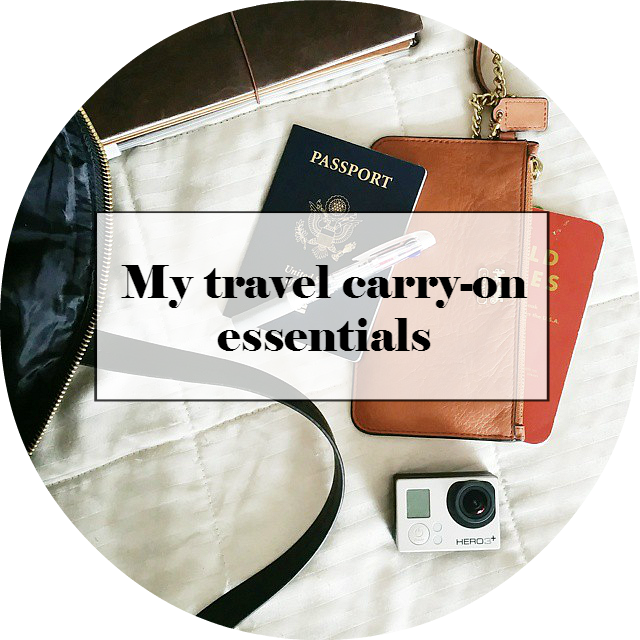 This was a timely post as I'm already trying to decide what to carry on our trip in July which can not come soon enough. Hi Tricia! Vacations always seem to come around so slow, right! Wherever you may go, though, I hope you enjoy your time there! Will you be using/bringing your new field notes size traveler's notebook? If so, I'd love to see how you use it! Awesome - getting ready for a paper and journal buying mission in Cali so this will serve me well!